I wanted to make on heck of a stinky breathe omelet and when Zo came out and asked what kind of omelet it was going to be, I told her a Morning After Pill Omelet. The idea behind this omelet is you wake up next to someone and you want to be left alone by them. So you make this omelet and after you both eat it, both your breathe smell so bad that you can not get near one another. Luckily for Zo and I we both love stinky cheeses, garlic and onion. So while it is perfect for us you may want to eat this one on you own! In a small mixing bowl beat three eggs using a whisk. Whisk in milk, green onion, sage and seasonings. In a buttered 10 inch skillet saute onion, garlic, mushrooms and sun-dried tomatoes over medium-high heat for 5-7 minutes. Spread the mixture evenly between both sides of the pan with a little space down the center. Evenly pour in the egg mixture, cover and let cook for 5 minutes or until the mixture begins to set at the edges. Now add your cheeses by placing them along one side of the omelet. Let cook 4-5 minutes covered. Fold omelet half without cheese over half with cheese using a spatula and let cook 2-3 minutes. 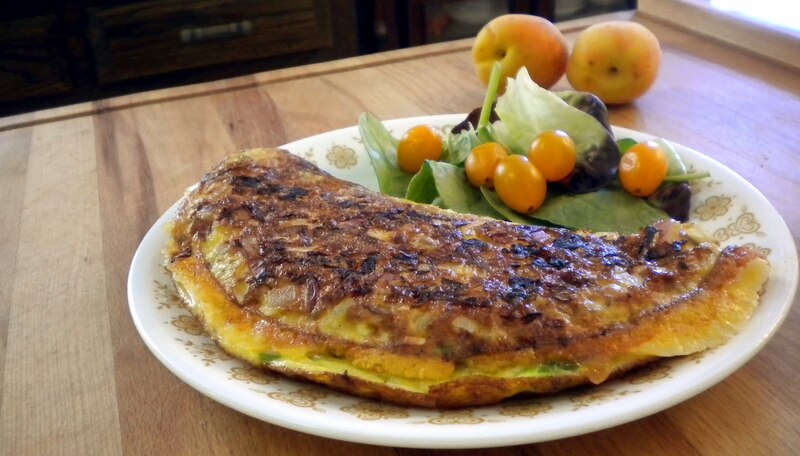 Slide omelet onto a warm plate serving with toast, fruit or breakfast rolls.